Today begins Hero Arts Virtual Cardmaking Party for Operation Write Home. My fellow hostesses and I were asked to host a challenge over at the Hero Arts Flickr group. 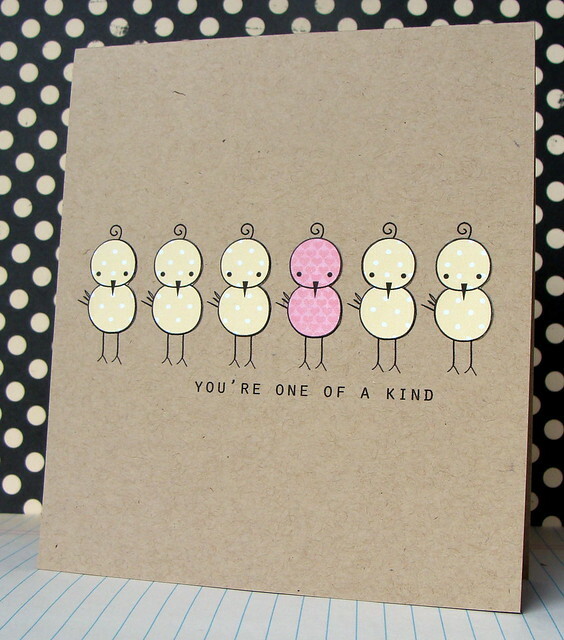 We chose a theme of Clean and Simple Cards of Encouragement... the details are HERE. You are challenged to play along and create a card to send off to this great cause. I used the cute chick from Hero Arts 'Sweet Girl' digikit, and paper pieced with paper from THIS kit. :) Very very very clean and simple! Love the sentiment with the one pink chick! Delightful card, Lucy! Sweet card and great inspiration for the weekend HA OWH challenges. I'm glad its Friday too and looking forward to messing about with papers and goodies all weekend. Lucy, this is soooo cute. Love the little pink guy! Lucy, this is too "TWEET" - not going to laugh at my own joke.....okay changed my mind teehee. Such an adorable card, Lucy!